Scientists have discovered a new way to analyze a man's sperm, which could help determine whether a couple can conceive through in vitro fertilization, or IVF. Women might still be getting paid 77 cents on the dollar, but equality between the sexes is coming to the world of fertility. A group of researchers, led by a professor from Wayne State University in Detroit, have developed a test for sperm that aims to give a more accurate measure of how much a wanna-be dad contributes to a couple's fertility, potentially helping couples conceive faster. 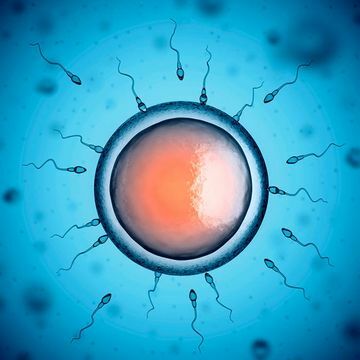 The scientists logged a series of 648 biological elements in a group of males from couples experiencing unexplainable infertility, meaning both the male and female had healthy sperm and eggs but still couldn't get pregnant. When all the elements were present, researchers found that the couple did not need much medical help to get pregnant. If at least one element was absent, however, specialized IVF technology was determined necessary for the parents to conceive a child. In other words, the test can help doctors understand more about the dad's contribution to the baby-making process—and what, if anything, is missing that make it difficult for his otherwise-healthy sperm to get his partner pregnant. This test is the latest in a growing amount of research that delves into the challenges of fertility and IVF in an effort to reduce the amount of mental, physical and financial stress couples must go through in order to conceive a child, since the success rate of IVF usually hovers around 30-35%. In another recent study, researchers from Oregon Health and Science University (OHSU), Stanford University, the University of Valencia, and IGENOMIX found a way to locate chromosomal abnormalities in embryos before they're implanted. Abnormalities are the main reason for IVF failure, so removing them from the healthy embryos gives couples more chances for success. "It is our goal to use this technology to reduce both the time to live birth of a healthy child and cost when couples seek infertility treatment to reduce the stress on the couple," Stephen Krawetz, PhD, associate director of the C.S. Mott Center for Human Growth and Development at Wayne State University and lead researcher on the sperm study told Fit Pregnancy. However, it's not quite ready for prime time. The researchers' next step is to get funding so the testing process can be simplified and expanded to the trial stage. "[This test] may become part of a routine examination as we move towards personalized and precision medicine," Krawetz added.